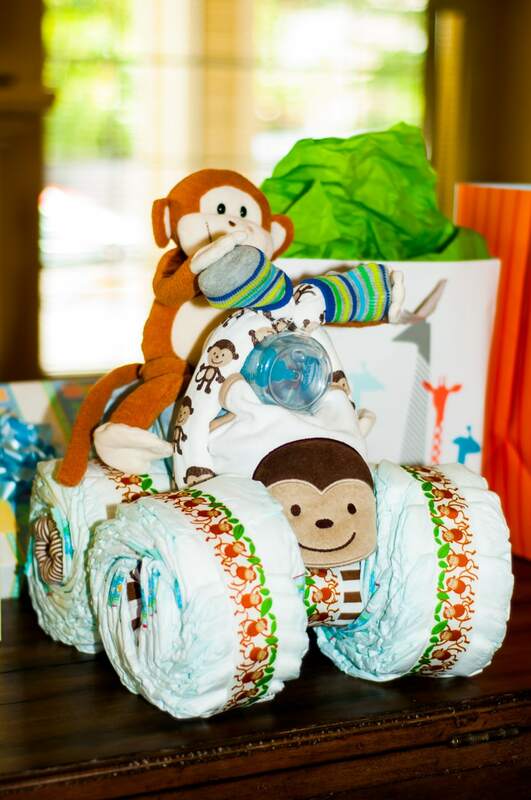 If you need an idea to create a diaper cake present for an upcoming baby shower, this Monkey Motorcycle Diaper Cake is sure to bring the fun. Use your imagination to add any theme you want. This 4-wheeler diaper cake is anything but the standard diaper cake, yet it is so simple to create. Follow these Diaper Cake Motorcycle Instructions on how to make a motorcycle diaper cake. If you’re needing something else that might be fun for a Minnie Mouse themed baby shower, check out my Minnie Mouse Centerpiece for Birthday. Great for a Disney themed baby shower. What do you need to make a diaper cake? Fill the cake pan with 15 diapers (per wheel) horizontally to create a circular bunch. Securely rubber band. Do this for each wheel, creating four. Set aside. Place empty paper towel roll on one receiving blanket and roll together. Leave about 1/4 in on each end. Tuck ends of the blanket into the ends of the empty paper towel rolls. Do this for the second axle. Push the covered empty paper towel rolls through the center of the diaper wheels to create the axles. Cover the rubber bands on the wheels with ribbon by measuring out the ribbon prior to cutting. Securely fasten with double stick tape. Put the wheels together and use a ribbon to securely attach the two axles. Take the Munchkin Dishwasher basket and cover it with one of the baby towels. You will want to wrap the towel tightly around the front of one side and bunch the rest of the towel in the back to create a seat. Use rubber bands to secure this. To create the handlebars and headlight, simply roll the second baby towel and wrap it around the front of the covered basket with the bottle in the center. Rubber band the top and leave the ends hanging to create handlebars. Place the socks at the end of the handlebars. Secure the basket in between the wheels and two axles. Place the stuffed animal in the basket and secure with double-stick tape. Embellish with anything fun. We chose to create a license plate for the back that was secured with double stick tape. Enjoy this at your baby shower!